Between November and December 09, the number of people reading the STYLECampaign newsletter on the iPhone, jumped from 4.4% to 10.4%. Pros: DeviceAnywhere allows you access to over 2,000 devices. All emulators, not static previews. On the iPhone this means you can use the zoom and scale functions, view in portrait or landscape and test if your landing pages are mobile friendly. They have an independent developers package, for the iPhone and Android only. Also a 3hr free trial. Cons: Still need a second solution for email client previews. Have to install DeviceAnywhere on your system. Pros: Pivotal Veracity’s eDesign Optimizer, is the most comprehensive email preview tool I’ve seen. Email clients, IE/Firefox testing and a large selection of mobile devices are available. They even support the iPad. 1. Link, alt tag and image validator. 2. Tells you how long it takes your email to load on a mobile. 4. Design guide on hand, need to know if Blackberry supports word spacing? 5. Can choose which screenshots to export as a PDF. 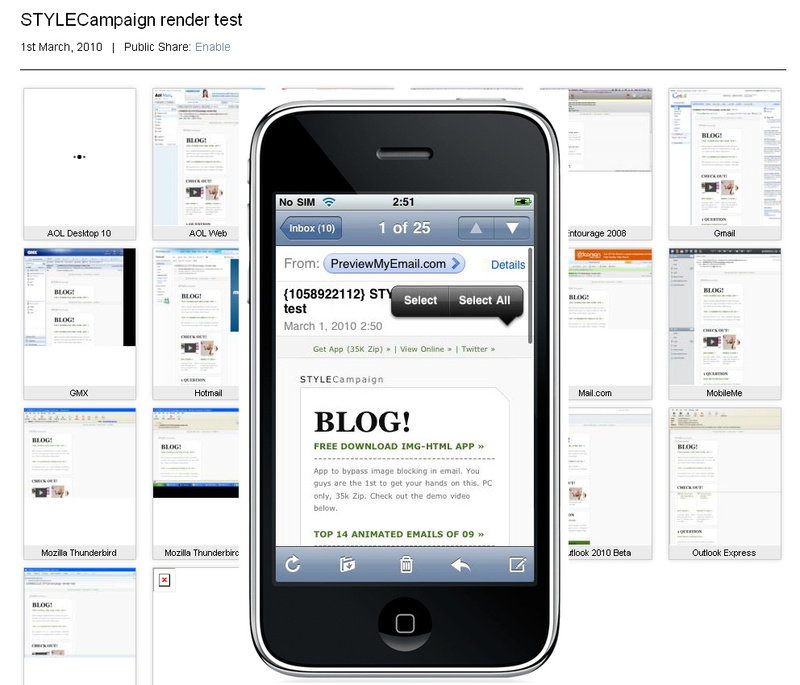 Cons: Not an emulator, you can’t do usability testing – zoom/rotate ect on iPhone. 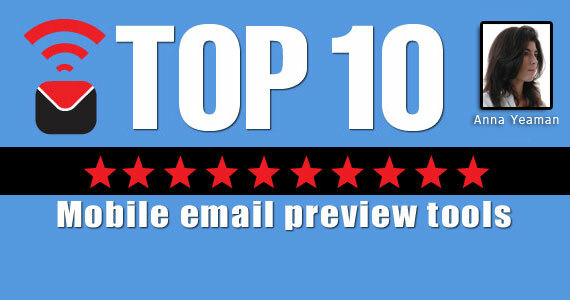 Same with all the email specific preview tools below. 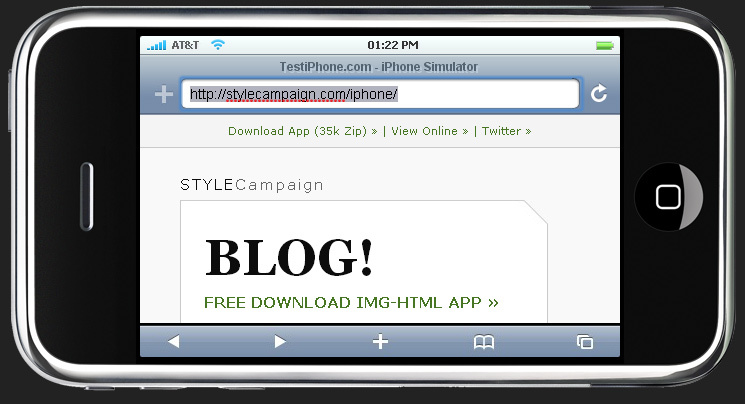 Pros: Finding a way to preview the STYLECampaign newsletter on the iPhone – on a PC! – was my priority. Shaun Sullivan’s free WebKit hack, enabled me to log into my Gmail account and bring up our newsletter (See left). 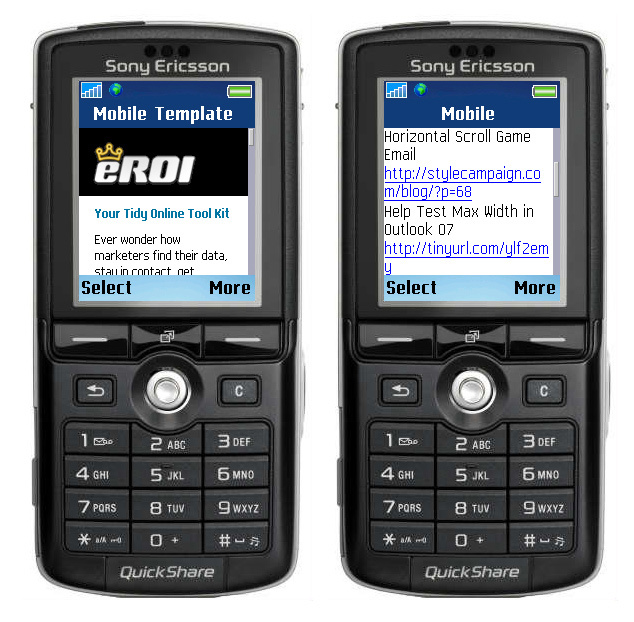 The image on the right, shows the mobile version of my test account in Campaign Monitor. Cons: It not perfect: zooms, scrollbars, shrink to fit and rotation are not supported. Need to install the iBBDemo.exe and Safari. Pros: PreviewMyEmail have a public share toggle. 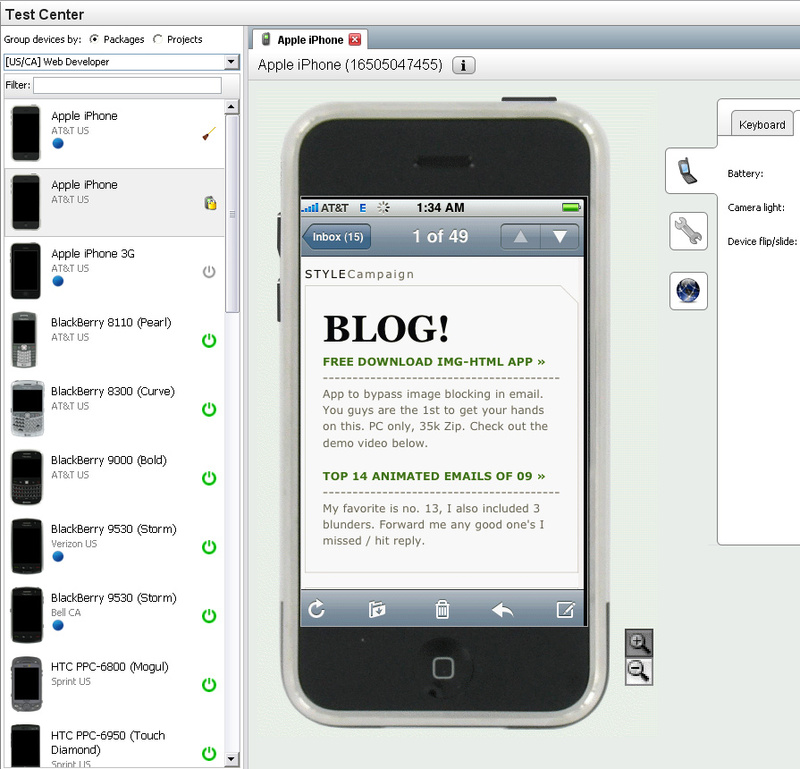 View screenshots of 22 email/mobile clients including the iPhone, Windows Mobile 6.1 and even Outlook 2010 Beta. Cons: If importing your HTML from your desktop, images need to be hosted externally. No Spam testing or preview pane view. “We are still working on iPhone email testing, but this is something we hope to release within the next 4 weeks. At the same time we’ll be launching support for Symbian, Windows Mobile and BlackBerry testing as well”. 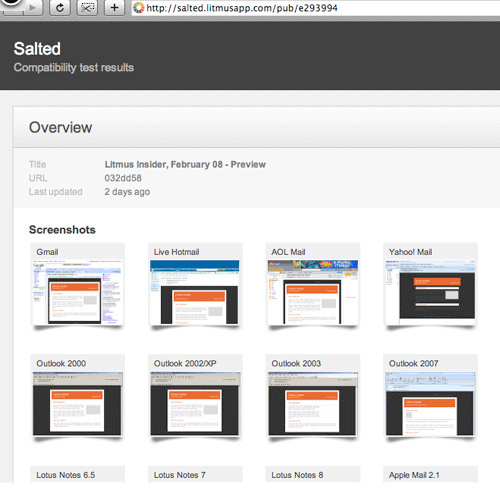 Litmus show your email with images on/off and in the preview pane. You can also make your test results public. 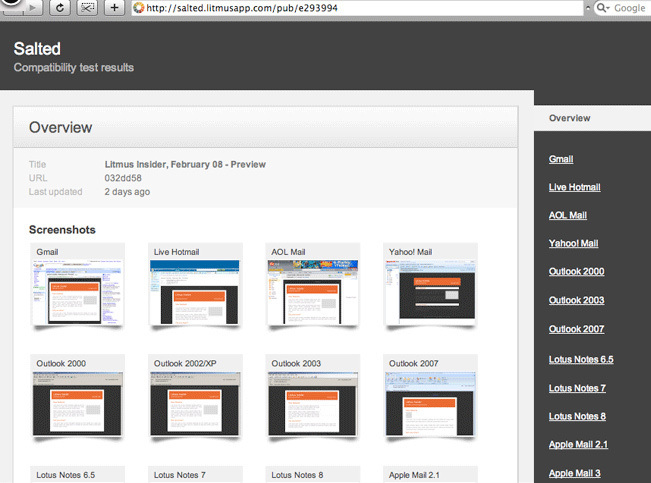 Check out the Litmus email client share report, just released. They collected data from almost 250 million email recipients. Pros: Campaign Monitor uses both Litmus and Return Path simultaneously. This ensures screenshots show up promptly. 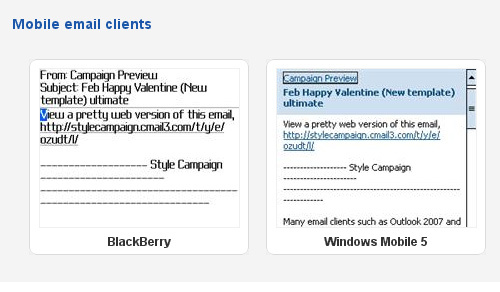 Besides 20+ email clients and all the popular Spam filters, Campaign Monitor supports the Blackberry and Windows Mobile 5. You can view your emails with images on/off and in the preview pane. Cons: No PDF export function or public sharing URL. No iPhone support at present. Though as they use Litmus, I’m guessing it will be available within 4wks. 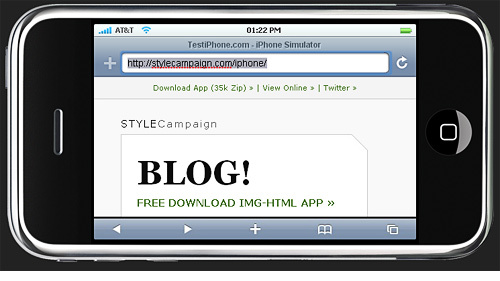 Pros: For 6 months I tested a,”Mobile Version” link in the pre-header of the STYLECampaign newsletter. Only a handful of people ever used it. When viewing the STYLECampaign mobile version on the Nokia N70 and Sony k750, I see how it could have been improved. 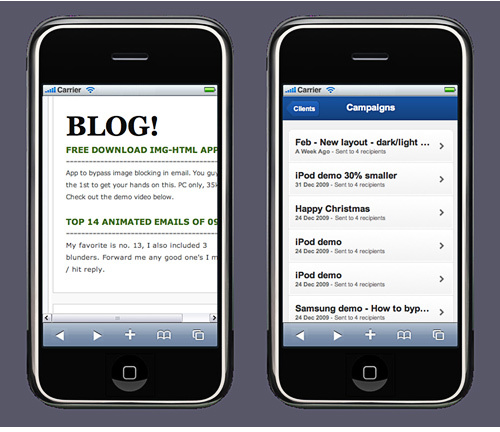 Compare how great eROI’s mobile version looks (left) with ours (right). They added color and styling, whereas we left ours plain text. Also see free tool mobiReady. It gives you an in-depth analysis, code validation and mobile readiness score. (plus 5 mobile emulators). Pros: TestiPhone is a free web tool, you can preview your email on the iPhone, in either portrait or landscape view. Cons: iPhone only, did not render my tracked URLs. Limited functionality, no zoom and scale. Pros: iPhoneTester is the same as TestiPhone. Free, web based with options for portrait and landscape views. When I typed in a URL with link tracking, it rendered (above). Whereas Testiphone would not. Cons: iPhone only. Limited functionality, no zoom and scale. 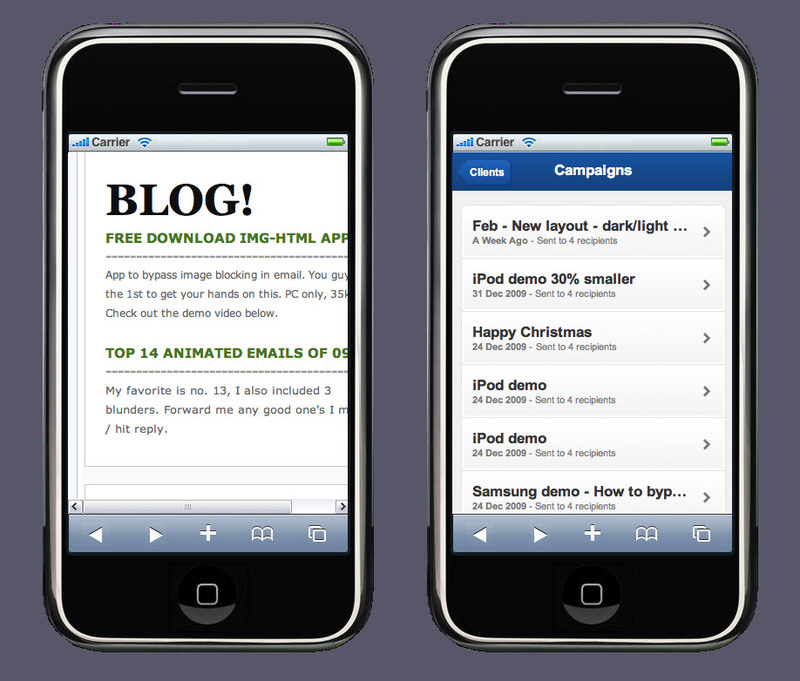 Pros: iPhoney previews how your emails and landing pages display on the iPhone. Portrait or landscape view, zoomed to fit/full size. Cons: It requires Mac OS X 10.4.7 or later. Pros: Free Apple SDK comes with an iPhone simulator. Takeaway: With 42% of US consumers claiming to own a smartphone, email designers are playing catch up. 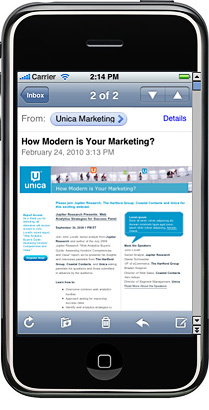 Pivotal Veracity’s research indicates that nearly 10% of B2C email is read on a mobile. If you haven’t already, grab MailBoxIQ or Fingerprint. 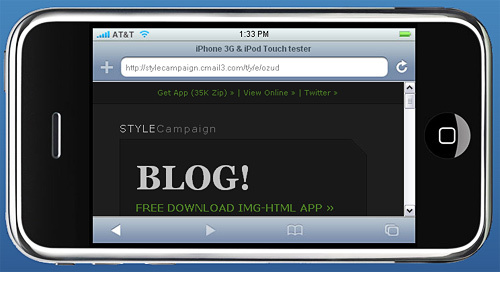 Find out how many of your subscribers are reading your email on a mobile and get testing. Profile: Anna Yeaman is the Co-Founder and Creative Director at STYLECampaign, an email creative agency in LA. Thanks for clarifying Erica, as you said that’s even more effective. I had a great time playing with DeviceAnywhere. It was incredibly useful to be able to use the zoom function on the iPhone for example. Definitely a keeper. Thanks much for including us (DeviceAnywhere) on your list! A note of clarification though: our Test Center solution is NOT an emulator. When you’re using our product, you’re actually interacting in real-time, over the Internet with over 2,000 devices that are stored in our device libraries and connected to carrier networks around the world. You get to see what the app looks like on the phone in verity and test how it functions–not just in a hypothetical sense. Much more effective! Hey Matt….thanks for pointing that out. We actually use the Return Path Campaign Preview tool through one of your resellers. The account does not have any mobile platform options. Is this a feature add on or standard on all accounts? Michelle Klann, of emailonacid, told me their primary focus is getting spam testing in place. Then move onto mobile device simulations – particularly the iPhone. She said they were hoping to release it in the next few months. Although emailonacid is great preview tool, I did not add them to this list as – unlike Litmus and Campaign Monitor – it was going to happen in months rather than weeks. We have plenty of mobile clients in our rendering/Campaign Preview module, and we’re adding more all the time. 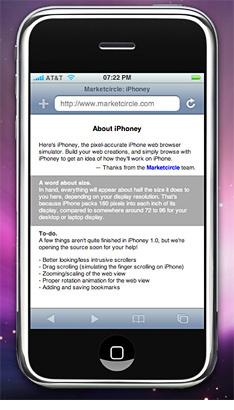 iPhone is coming a bit later this year as well, as is browser detection. For the last year+, Return Path has only covered the old first generation blackberry and windows mobile. They also only show you the 1st screen (meaning you can’t see the whole email!). This is my understanding why the RP reseller we use doesn’t bother including it. Cheers Fred! I must admit, I was a bit daunted by mobile rendering, but these tools have been a great help over the last few months…just figured others must be in the same boat with regards to testing. Enjoyed the post very much. Thanks for the comprehensive content. Just realized me and Jordan were replying at the same time :) As I mentioned in the post besides MailBoxIQ you can also check out fingerprint app. I’d like a list of ESPs which currently detect which email client/mobile is being used. Good luck with that post! Knotice is an ESP and our software Concentri detects the mobile device type, browser and OS for email opens and web page views. In addition to having mobile device type breakdowns in every campaign summary in our reporting environment (much like MailBoxIQ or Fingerprint), this data is captured at the profile level also, allowing Concentri users to segment their database and target email and web content to users based on their mobile device, or other attributes. Web pages can also be dynamically styled to optimize the experience for users of different devices. 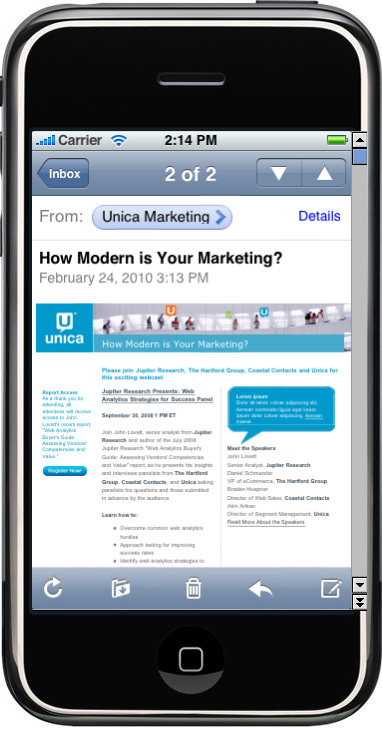 This native capability made our recent Mobile Email Opens Report possible (PDF) http://www.knotice.com/reports/Knotice_Mobile_Email_Opens_Report_Q42010.pdf. Published this week, it is a comprehensive report on email open activity by device types, time of day, industry, and geography. We are always looking for more brands to participate in the study to help us provide insightful data across industries. 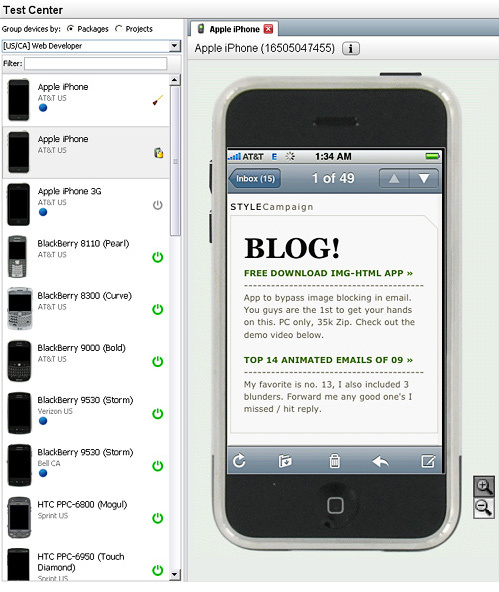 Pivotal Veracity have the iPhone (and iPad) and a bunch of other mobile devices as part of their eDesign Optimizer preview tool. They also have MailBoxIQ, which I believe gives you a breakdown of how many people are reading your email on a mobile and which devices. 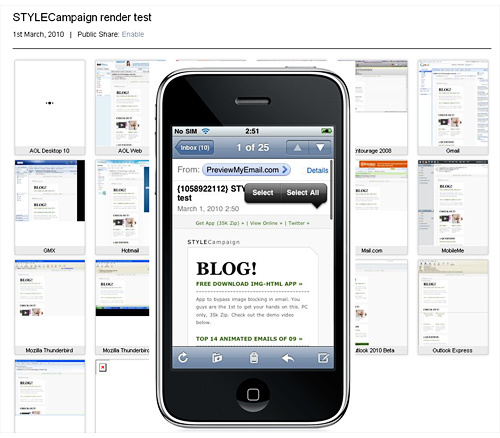 Campaign Monitor gives you an email client breakdown for each campaign you send, including the iphone. Hi Jeff — we actually do have inbox monitoring for iPhone (and nearly all other mobiles) and now even iPad at Pivotal Veracity with our MailboxIQ solution. 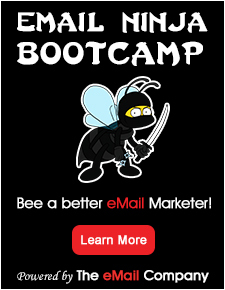 You can check it out here: http://www.pivotalveracity.com/email-marketing-solution/mailbox-iq.html. We also have some early case studies and findings in our Resource section. MailboxIQ goes beyond what’s after the @ sign, and tells you the actual email client being used to open the email — and by individual customers, not seedlists. Pivotal Veracity offers it directly as well as through leading ESPs like ExactTarget and MTAs like Zriniti which have integrated it into their platforms. Happy to speak to you anytime. Give us a shout at 602.971.0502. Hey Anna…great post!!! Love the research and comparison. I am wondering why ReturnPath has not added iPhone or mobile as part of their inbox monitoring suite. I think they are both missing the proverbial boat. I am going to begin to ask around but if anyone is using an ESP that can detect which email client is opening or rendering the message, WE WANT TO SPEAK WITH YOU!!!! !